Subtitle: THE most important story of the Afghanistan - Iraq Wars is that Depleted Uranium munitions dust is slowly killing the civilian population -- over the next 20 years, no civilian will be able to live in Iraq. Here, we demonstrate how Nature effectively moves contaminated dust from the battlefield to the cities, and to nations beyond the country's borders. "BAGHDAD (AFP) - Thousands of people were left suffocating as a massive sandstorm brought life in the war-torn Iraqi capital to a virtual standstill. Nearly 1,000 cases of suffocation were reported at the city's Yarmuk Hospital which saw one 60-year-old woman die. Hundreds of other people visited private clinics and family doctors as a fog-like cloak of orange dust sat over the city. Traffic came to a virtual standstill as commuters stayed at home, while those who dared step out wore masks or covered their mouths with piece of cloth to keep the dust out. The capital's main airport was also shut with no flights taking off." " 'You can barely see 15 meters (yards) ahead', said police Captain Ali Hussein as he struggled to cope with the sandy onslaught at his traffic post in a central Baghdad square ... I have never seen anything like this before," Hussein said, wearing dark sunglasses and a mouth-cover, but his uniform covered in dust. They (the police department) have not given us anything to protect us from such weather. I bought this mask on the street and need to buy some more for my colleagues'." While residents are used to wearing masks to offer some protection against these routine dust storms, but what they do not realize is that Depleted Uranium dust is usually so small that it passes right through masks. These protective devices are absolutely no protection against DU-contaminated dust. Notice that this news story says that many people are literally "suffocating" in this sandstorm. While this sandstorm was so unusually heavy that this article described it as a "freak", normal sandstorms which blow throughout Iraq and the Middle East are nearly as bad. During the first three weeks of fighting after our invasion of March 20, 2003, battles were abandoned on both sides at least twice if my memory serves me correctly because sandstorms whipped through the area. We have kind of gotten ahead of ourselves here in describing the lethal nature of Depleted Uranium dust, so let us now speak to its scientific nature. Only then can you understand how a sandstorm like the one pictured above could become such an instrument of death -- so deadly a weapon you can only think of Seal #3 in Revelation 6. "When a DU shell is fired, it ignites upon impact. Uranium, plus traces of plutonium and americium, vaporize into tiny, ceramic particles of radioactive dust. Once inhaled, uranium oxides lodge in the body and emit radiation indefinitely. A single particle of DU lodged in a lymph node can devastate the entire immune system ..."
Once exploded, DU munitions turn instantly into fine dust. This dust then mixes with the dust on the ground and starts to kill civilians who breathe it into their lungs. If people could avoid breathing this dust, they could avoid contamination and prevent the onset of slow, agonizing radioactive death. Most of the warhead becomes either extremely small fragments -- though larger ones are possible -- and a whole lot of radiation dust. Thus, when a person travels through the battlefield, they breathe in the particles that are now lingering in the air, plus they get a lot of radiation on their clothes. Let us hear from an expert on this type of exposure. Did you catch this statement? ""Any soldier now in Iraq who has not inhaled lethal radioactive dust is not breathing." This means every single soldier -- and every single civilian -- has tiny particles of Depleted Uranium dust lodged in their lungs, emitting radioactivity throughout their body 24 hours a day, 7 days a week. This medical tragedy was confirmed to me by phone by my retired Army Major source. In fact, he confirmed the statistics of the Gulf War I veterans, which we review in shortly. Virtually 100% of the ground troops are radiated to a degree that is troublesome; if Gulf War I is any guide, 75% of the men now serving on the ground will develop one or more of the exceedingly serious medical conditions we list below, in the section covering Gulf War I. In fact, the soldiers who come after the fighting troops to occupy and administer the land are the ones who are most affected! This radioactive dust is virtually impossible to clean up because it is so fine and covers everything -- from burned out and wrecked vehicles to houses in the area to the ground on which children may ultimately play. In residential areas like Basra, this consideration is frightening. "Understand that the US government has now admitted that the soldiers in Iraq are fighting a guerrilla warfare. This takes a lot of activity, in excessive heat, and dehydration can occur rapidly. Men can't just stop every hour for a water break, to allow the body time to acclimate and adjust to less water intake in extreme climate conditions. The first noticeable effects will be less mental acuity, with a slowing of reflexes and general malaise. This puts our men in extreme immediate danger if in combat readiness. If the men don't die of guerrilla assault, then they will surely die when more severe effects of dehydration occur, and ESPECIALLY quickly under toxic conditions. I don't know if you saw the news report last week, but the government is saying Iraq will be a year-long tour for some of them. If those men make it past guerrilla assault, and dehydration, then they get to carry home their illness!" We reported, above, that these naturally-occurring, frequent sandstorms blow all through the Middle East, including Iraq. The civilian population is terribly exposed to Depleted Uranium dust because of these sandstorms, but then, so again are our soldiers. Please take a moment to study this picture. 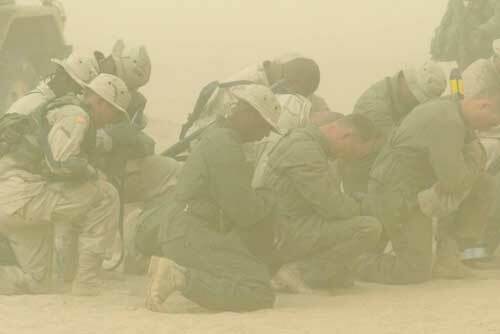 These soldiers appear to be praying during a sandstorm. Notice that these men are not wearing any kind of mask; therefore, they are breathing in the dust as it swirls around them. To begin dying, a soldier's body only has to ingest one tiny speck of radioactively contaminated dust. These men are probably the "walking dead". Last year, a startling expose' on D.U. munitions was posted by a retired "Chief of the Naval Staff, India", Admiral Vishnu Bhagwatt. Ever since I learned about D.U. last Summer, I wondered when competent, trained military men from other countries were going to start speaking up against the pollution we are spreading throughout the world with our Depleted Uranium military machine. Admiral Bhagwatt spoke up forcefully and scientifically. Notice that "WMD" (Weapons of Mass Destruction) is part of the title. Remember Cutting Edge teaching that, in this rarified political air since 9/11, the truth of a matter is most often discovered by looking in the exact opposite direction (NEWS1558)? Nowhere is this most evident in the propaganda lies which Bush/Blair spread before the invasion, to justify the attack against Iraq. Dubbed "Iraqi Enduring Freedom", our attack was based upon the lie that Saddam possessed frightening quantities of WMD which he could launch against enemies in the Middle East and which he could give Osama bin Laden for use against American cities. The truth of the matter lies in the exact opposite direction of the public rhetoric. While Saddam never did possess WMD which he could weaponize, President Bush and Prime Minister Blair did launch a silent WMD war against Iraq and Afghanistan. America was the first nation to ever use atomic weaponry in battle when we bombed Hiroshima and Nagasaki in 1945; today, we are the only combatant using WMD in war - in Iraq and Afghanistan! Silent radioactive Depleted Uranium warfare has been unleashed against the entire Middle East, as this next article makes quite clear. DU weapons emit 'Alpha' particle dose to a single cell from U-238, which is 50 times the annual dose level. Cancer is initiated with one alpha particle, its daughter isotopes effect generations as the isotopes bio-concentrate in plants and animals and travel up the food chain. It is a nuclear weapon ... They enter the body through the lungs, the digestive system, or breaks in the skin. One gram of DU releases more than 12,000 particles per second. The radiation slowly kills the cells that make life possible. The Gulf War Syndrome of 1991 did just that (reported by Dr. Asaf Durakovic, Professor of Medicine, Georgetown University)." 1. Cancer is initiated in a person when that person ingests just "one alpha particle"! This is consistent with what our original sources told us. When either a soldier or a civilian breathes in just one dust speck contaminated with DU, that person will ultimately get cancer. The process may take 3-12 years, but that person will eventually die. Dust blows throughout arid Iraq, thus making it likely that most of our soldiers and Iraqi civilians, will ultimately breathe in a speck of dust contaminated from an exploded DU munitions. Later in his report, Admiral Bhagwatt reported that this contaminated dust has spread in a 1,000-mile radius from Baghdad! 2. D.U. is scientifically considered to be a "nuclear weapon". Thus, each of our last three Presidents have waged a silent nuclear war against countries with majority Muslim populations: Iraq in 1991; Kosovo in 1999; Afghanistan in 2001 and Iraq in 2003. 3. Since D.U. poisons the air, the dust, the water and the food chain, my original sources were right again when they warned that we were rendering Iraq unsuitable for human habitation. This process is likely to take a generation, but it will occur. 4. 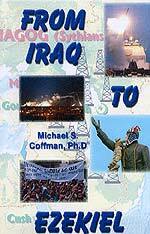 The 1991 "Gulf War Syndrome" was largely D.U. poisoning. As our medical officer in a foreign army warned, the D.U. interacts dangerously and unpredictably with the toxic vaccinations to produce a variety of maladies amongst its victims. Whenever I have written that we are quite possibly poisoning the entire land, people have objected, saying that we did not ruin the land of Japan by detonating atomic bombs over Nagasaki and Hiroshima. Not being either a scientist or a trained military officer, I could not offer a reasonable explanation for this indisputable fact. The good Indian Admiral has done just that, quantifying the disaster in terms laymen can understand. Did you catch the relevant statistic? "Countries within a 1000-mile radius of Baghdad and Kabul are being affected by radiation poisoning ..."
Take a map of the Middle East and then calculate a radius showing 1,000 miles from these two cities, and you will discover that every single country -- except Israel -- on which DU dust is blowing is a Non-Integrating State (NEWS1833 and NEWS1906). Countries due West of Iraq receive a fraction of the DU dust blowing Eastward, because of the prevailing winds. Therefore, the answer to the people who said our bombing of Nagasaki and Hiroshima did not permanently pollute Japan have their answer from Admiral Bhagwatt. Had we exploded 250,000 Nagasaki-type bombs in 1945, Japan would likely uninhabitable today because of radiation pollution. Iraq is not only in deep trouble because of our 2003 bombing, but also because this is the second time in 12 years we have subjected that country to "Trojan Horse" nuclear warfare. Now, can you see why so many of the Iraqi people have gotten so very, very angry -- not welcoming our soldiers with bouquets of flowers and kisses, but will bullets and bombs. The United States and Great Britain have most definitely waged nuclear war upon Iraq and Afghanistan. 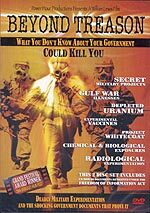 The retired Indian Admiral was right in NEWS1907 when he declared that Depleted Uranium munitions is nuclear war because it is derived from a nuclear atom and it possesses the same radiation as you get from U-235 and U-238 uranium; in fact, this is exactly the source of Depleted Uranium! D.U. possesses 30% of the radiation that was present in the original uranium ore! While we are very careful in civilian life to not expose anyone to any level of uranium radiation, our military thinks nothing of exposing both civilians and our own soldiers to uranium poisoning, and have done so without warning our soldiers of the risk. Today, Iraq is thoroughly and heavily contaminated with uranium poisoning at the level where life cannot be sustained for very many years. Further, this type of contamination lasts for 4.5 billion years. If you study the map of the "Non-Integrating States" we show on NEWS1833, you will realize that the winds are blowing this radiated dust 1,000 miles to the southeast if the Sharqi or Sirocco winds are blowing and to the northwest if the Shamal winds are blowing. Therefore, all of the "Non-Integrating States" to the Southeast and Northwest of Iraq and Afghanistan are being irradiated! The Indian Admiral also said that New Delhi was getting irradiated uranium dust from Afghanistan, 640 miles southeast of Kabul. The common sandstorms which blow throughout the Middle East are the natural means by which the Depleted Uranium dust deposited on the battlefields of Iraq and Afghanistan are blowing all over those countries, as well as so many other countries throughout the world. 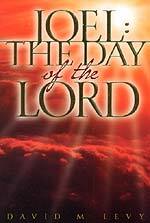 Is it possible that DU dust may be part of the Seal Number Two war prophecy of Revelation 6? 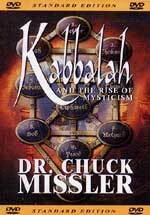 Listen to the prophecy and reach your own conclusion.